Annabel Lee & a plate | Que Sera Sara? Fall is in full swing round these parts. Something about autumn feels super crafty and homespun and charmingly rustic. If there were orchards, I’d be pickin’ and bobbin’ with the best of them. Sadly, there are not. No home-made candy apples for me this year. Instead, with a relatively free afternoon, I decided to do a craft project. No, that doesn’t do it justice. You really need the full picture here. Not only did I get out the acrylics and go bargain hunting in thrift shops, I got the idea from browsing Country Living Magazine. Seriously. Sometimes I think I’m a hairbreadth away from a life of faux turtleneck dickies and applique sweatshirts. Honestly. Anyway, I saw this photo on Pinterest (my new favourite thing) and it made me surprisingly happy. Surprising because when a murder of crows hovers over a dining table, happy is not the first thing I would have guessed should come to mind. It all feels rather deliciously Poe. 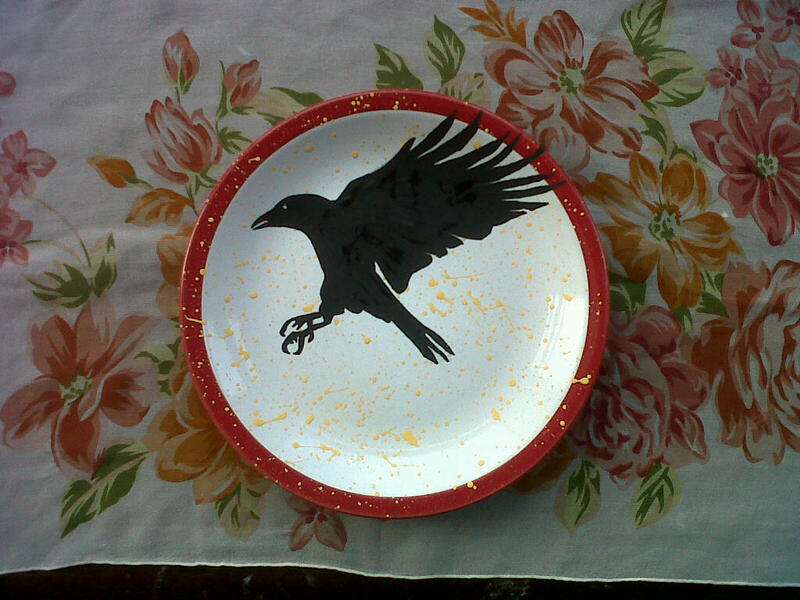 Naturally, I decided to make an avian plate of my own. Not wanting to muck up any of the nice plates I’m collecting for #14 (let’s face it, I am no Martha Stewart), I went hunting for a suitable sacrifice. For 99p, a plain white salad plate with red edges in the dreary basement of the aptly monikered PoundStretcher seemed perfect. Now, lucky for me Country Living designs craft projects for even the most challenged of us. So easy, I even had the confidence to muck about with it. I didn’t bother with a paint brush. I used a bamboo skewer so I could get into the really tiny bits with the pointy end. (Bonus point #2). Also, no washing up! It’s not quite dry yet, but I think it turned out pretty good for an hour’s work. I wonder if it is worthy of fulfilling #6. He’s not awesome but I think I’ll keep him. He just needs a name. And a home. Update: He has been christened, fittingly I think, Edgar. He lives on our bookcase and seems terribly pleased to be there. I have been dying to see Portlandia! I saw a preview online ages ago and it seemed perfect for my twistedly home-grown humour. Don’t think it’s broadcast here, but maybe I can find a DVD when I’m state-side.